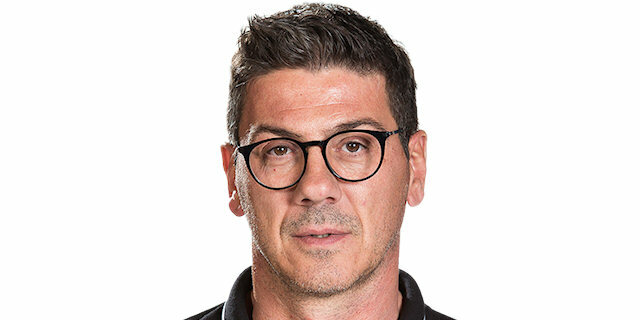 Assistant Coach AEK Athens (1998-2003)...Head Coach AEK Athens (2003-05)...Head Coach Dynamo St. Petersburg (2005-06)...Head Coach Valencia CB (2006-November'08)...Head Coach Aris Thessaloniki (October'09-January'10)...Head Coach Bizkaia Bilbao Basket (January'10-2013)...Head Coach UCAM Murcia (2015-16)...Head Coach Lokomotiv Kuban Krasnodar (2016-November'16)...Head Coach UCAM Murcia (January'17-June'17)...Head Coach Hapoel Jerusalem (2017-....). 2013 EuroCup Coach of the Year. Head Coach Greek National Team (2014-16).